Get your new listings out first with Just Listed email messages. Be the first real estate professional to announce your new listings to your contacts with Just Listed email messages. Just Listed is an easy email tool that equips you to quickly send announcements about your brand new listings. 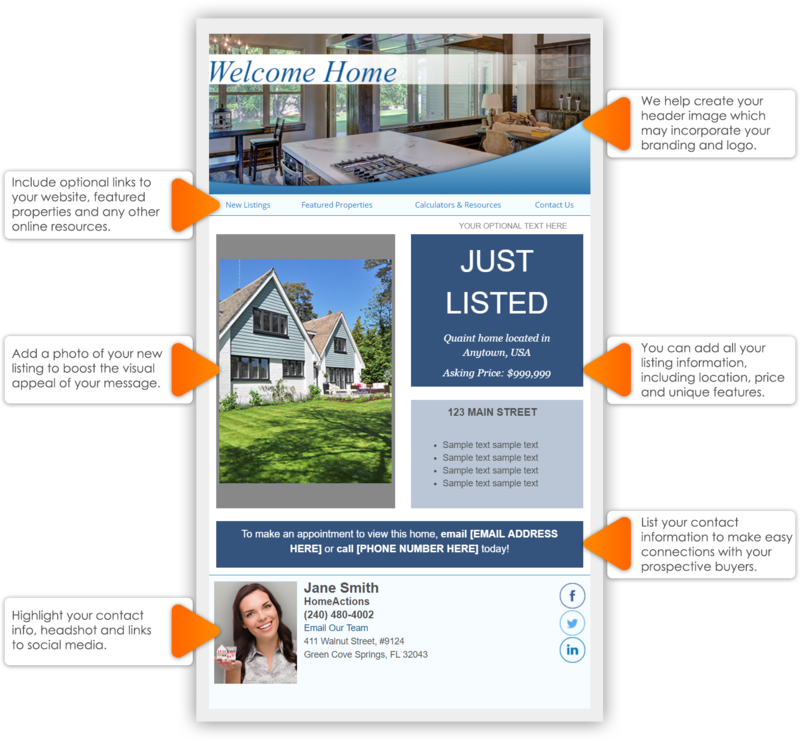 This email marketing tool helps you create and send an email to your contacts featuring a newly listed property within the 24 hour period BEFORE it is posted to MLS. With innovative technology, developed through a partnership with HomeActions and ZiplogixTM, you now have a simple and affordable way to quickly get your new listings in front of your contacts. Plus, our friendly, knowledgeable Customer Support Team will be on-hand to walk you through every step. Choose a one-time message send or save when you access unlimited packages at monthly, annual or 3-year rates. Once we gather your information, our Customer Support Team will complete your message setup for you and send you a preview before it launches to your contacts. You also have the ability to track message sends, opens and clicks with the reporting tools available in the HomeActions platform. Choose one of the affordable options below to get started. After you choose your preferred package, a member of our team will contact you and start walking you through your quick and easy message setup. Send a single Just Listed Message for one launch. NO setup fee for returning or existing customers. Unlimited Just Listed launches for a one month period. Includes one month of access to OnTarget. Unlimited Just Listed launches for an entire year. Includes one year of access to OnTarget. Unlimited Just Listed launches for a three year period. Includes three years of access to OnTarget.